The Audi A5 is a medium-sized two-door coupe aimed to attract buyers of the BMW 4 Series and Mercedes C-Class coupe. Audi have not changed the design dramatically for seven years, and yet it still remains popular worldwide. The Audi 'quattro' four-wheel-drive system is also available on models lower down the range, so you can enjoy the benefits of extra grip and safer handling in poor weather if you're willing to pay a bit extra over the standard front-wheel-drive models. Front-wheel drive also sets the A5 coupe apart from its chief rivals: the BMW 4 Series and Mercedes C-Class coupe are both rear-wheel drive, which arguably makes them better driver's cars but also more unpredictable in slippery conditions. The A5 also has a choice of either a six-speed manual gearbox or one of two automatics: S tronic and Multitronic. The latter two are a little more expensive, but they're also more desirable. The A5 coupe is very comfortable and well-appointed and powered by extremely economical engines. The 2.0-litre TDI is most popular and is capable of 4.2 litres/100mkms and doing 0-100 kmh in 8.3 seconds. On the other hand, the S5, equipped with a 3.0-litre petrol engine and Quattro four-wheel drive is capable of doing 0-100 kmh in just 4.9 seconds, and uses 7.7 litres/100 kms. 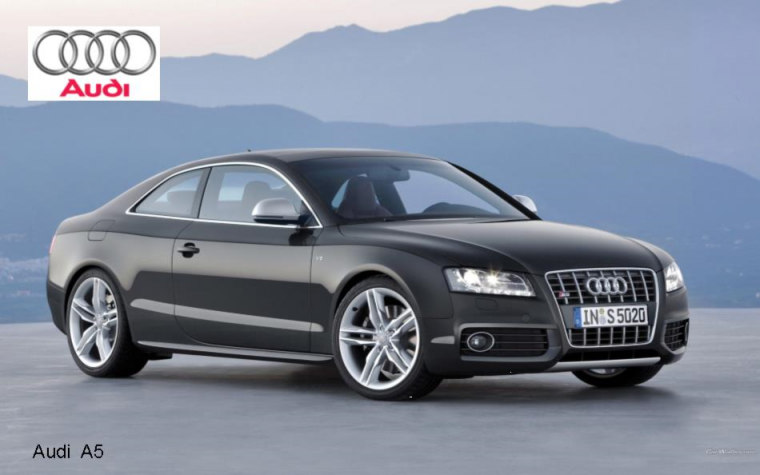 The S5 is not the only Audi A5 with `Quattro 4 Wheel Drive` as most versions of the A5 coupe are available with Quattro. Otherwise, the standard A5 is fitted with safe and predictable front-wheel drive, (Mercedes and BMW rivals use sportier rear-wheel drive). The A5 isn't the most comfortable coupe in its class and reviewers find the rear seat cramped for large passengers. From a safety point of view the A5 is fitted with six airbags, front and rear parking sensors and electronic stability control.